Nobody who has been exposed to the US stock market over the past five years should have much to complain about. As companies have announced a lot of very good news on their earnings and revenues since the previous peak in January, it is also fair to say that stocks are better value now — although it is still highly questionable to say that they are actively good value. I will not rehearse the arguments about valuation yet again. But what can we make of investors' behaviour, and does it show growing or declining confidence? I have made some of my problems about technical analysis clear in recent months, and received plenty of aggrieved responses, but it makes sense to try to work out how Mr Market is behaving. Trying to turn technical analysis into a hard science is a problem; using it to help what are necessarily subjective judgements about the state of opinion, however, makes some sense. On this basis, there are two broad reasons for concern. One is that US stocks may be forming a “double top”. 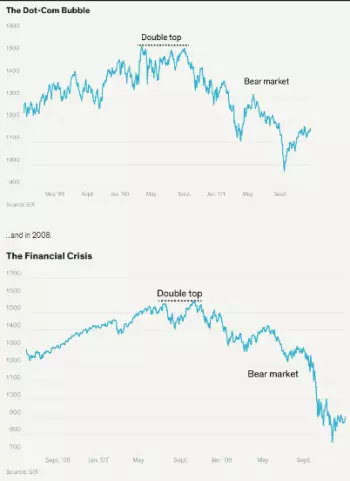 This week, Barron's carried the ominous headline: The S&P 500 Might Be Forming a Dreaded ‘Double Top.’ A “double top” pattern is one of the best known signals in technical analysis, and implies that a market will go into a prolonged fall thereafter. Is what has just happened comparable? The second part of the Barron's headline is more reassuring: Here’s What That Is and Why You Shouldn’t Worry Just Yet. It is certainly unusual for a market to reach a top, correct, and then take as long as seven months to make back its gains. Generally, if you have waited that long, it is because the correction will turn into something worse. But the science is not hard and fast. The market's high, followed by the China-driven break of 2015, and then a virtual recovery before another sell-off in early 2016, looks a bit like a double top. But it wasn't. Should the market stage an advance in the next few weeks, then we will not have a double top on our hands and there is nothing to worry about. A fall from here would be worrying — it would suggest investors really were uncomfortable trying to take the market to a new high. But so far we cannot say that this is a double top. 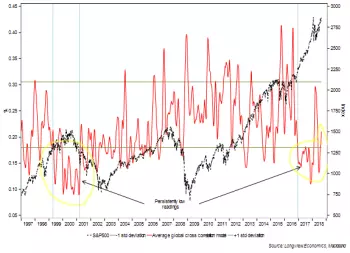 Barron's also cited analysts pointing out that the slow and steady recovery of the last few months might suggest that this is a well-supported return of confidence, while another suggested that we need to look at internal measures of market breadth. 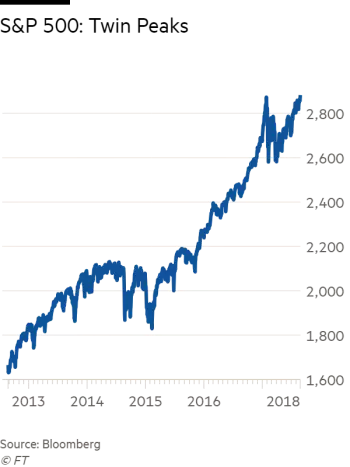 So there is simply no point in worrying about a double top just yet (although it gave Barron's a good headline, and me an excuse to link to the theme tune from Twin Peaks). 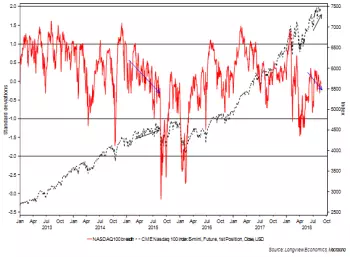 The issue of breadth may be more interesting. 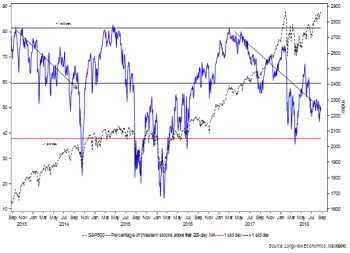 Longview Economics of London published some disquieting analysis of market breadth last week. This shows in blue the percentage of world stocks (from the US, eurozone and Japan) trading above their 200-day moving averages against the S&P 500 itself. The decline in breadth since late 2016 (and the US election) is marked and clear-cut.